The economies of the United States and India greatly complement each other but more must be done to enhance the relationship, according to the top State Department official in charge of South Asia. 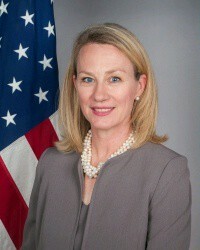 Speaking at the U.S.-India Business Council meeting today, Alice G. Wells, Acting Assistant Secretary for South and Central Asian Affairs and Acting Special Representative for Afghanistan and Pakistan, noted the “vast complementarity’ in the economies of the two democracies. Wells was speaking at the ‘Road to the Global Entrepreneurship Summit’ (GES) Conclave’ organized by the U.S. – India Business Council, at the U.S. Chamber of Commerce in Washington, D.C. The GES is an annual entrepreneurship gathering that convenes emerging entrepreneurs and investors, linking them to governments and showcasing projects, ideas, and new opportunities for investment. This year, the United States is co-hosting GES with India. 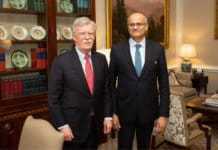 Noting the balance of trade in favor of India, Wells indicated that the 350 million middle class in that country held ‘extraordinary potential’ for balancing that gap. “Emerging middle-class consumers will have new demands in areas such as education, health care, and financial and professional services — fields where U.S. companies have much to offer,” as does the food and agricultural industry in this country. She also dwelt on the aviation and energy sectors as areas ripe for expansion, noting the recent purchases by SpiceJet and Jet Airways of Boeing aircraft; and India being the third-largest energy consumer. 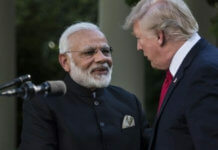 “Many have questioned how Make America Great here and Made in India can be compatible, and indeed, we do need to do more to balance the U.S. trade deficit with India, which totaled nearly $30 billion last year,” Wells noted. But powerful examples exist “of the vast complementarity of our economy,” she said, and the Global Entrepreneurship Summit is an opportunity to highlight that complementarity. “As we launch the “Road to GES: U.S. Series” in communities throughout the nation, we aim to share first-hand the best practices of the U.S. start-up ecosystem and the innovation and new perspectives of Indian entrepreneurs that can generate new approaches to 21st century problem sets and contribute to job growth and prosperity in both our countries,” said Wells. Entrepreneurs would be a big part of the solution to creating the one million new jobs India needs every month to employ its rapidly growing labor force, Wells said. She will be attending the GES Nov. 28-30 in Hyderabad.